Skinned Knuckles: Wiring HarnessComing Jan 15! Share a photo and specs of your ride with other car fans! Any automotive enthusiast should have this gear. Tiffany from Dannmar stops by the garage to demonstrate MaxJax, a great alternative to traditional lift systems or jack stands. Jay's charming vintage Fiats embody the romance and practicality of the brand. He's excited to see what Fiat will bring Stateside since its merger with Chrysler earlier this year. Jay travels to the Simeone Museum in Philadelphia to check out this 1929 DuPont Le Mans Speedster, restored exactly as it appeared on race day at Le Mans by family scion E. Paul Dupont in 1960. 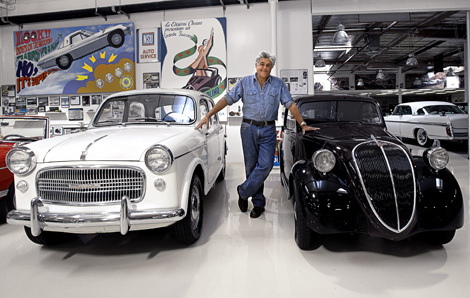 Sit down with Jay for a guided tour of Art's extensive library of works on the Golden Age of Motorsports, including books on drivers Ken Miles and Carroll Shelby, and historic races that once took place at Pebble Beach and Paramount Ranch in Malibu. All Rights Reserved. The Jay Leno Show.